Remember that time I majored in horticulture and green house production and started a farm? Wait, I did one of those things, but not the other. I actually majored in Communication and minored in visual arts…..nowhere near horticulture, or biology, or anything science-related. I also made sure to totally steer clear of anything that dealt with math (although, I really loved and was good at Geometry in high school, probably because it was math on a visual level). These two subjects are really important and more girls should major in them. I, unfortunately, wasn’t that girl and I, unfortunately, was reminded of that this week. I totally and completely screwed up my Cafe Au Lait dahlias this week. Dahlia tubers are really expensive. But, once you purchase and grow them, they basically double in size each year, thus doubling your investment. I just very effectively eliminated my investment. Chris and I dug up the tubers a couple of weeks ago and placed them in a bulb crate. Chris asked if I wanted to take them to the basement, and I said “No, I’ll get them tomorrow and individually wrap them in saran wrap and then get them in the basement.” Obviously I knew what I was doing, Chris, no need to question me. I’ve done my research, man. A couple of weeks passed with the dahlia tubers sitting in the hoop house. Last weekend, Chris brought them up to the house and showed me the shriveled up, dry tubers. NOT GOOD. So I will be on the horn next week to be sure I can re-order these for next year. If I could, I would literally kick myself in the pants. So, future Audra, here’s the lesson: never start a job that you aren’t going to complete in the same day. This week, we also had the opportunity to speak at a Local Food Summit. We spoke to regional specialty crop growers on why telling your story is such a vital part of a farm marketing strategy. I brought my phone (which was on vibrate) up to the podium with me, to be sure we weren’t long winded and stuck to our allotted time frame. Chris had the first part of the speech and as he was speaking, my phone vibrates. It was our son’s daycare. I let it go to voicemail, knowing that if it was an emergency, they’d call right back. I frantically searched the audience for my father-in-law, had to slink off stage right, gave him the wide-eyed “I NEED HELP” look. When he met me I had to do a rushed, stage whisper, “TAKE THIS CALL, SOMETHING IS WRONG WITH LINCOLN”. Slink back upstage, and pretend like nothing was wrong all the while only being able to think about what every mother in the history of the universe is always worried about: their child lying in a ditch somewhere crying unconsolably for their mother. I see my father-in-law come back into the auditorium, I slink again off the stage with my forced “nothing’s wrong” smile. “He just bonked his head and has a goose egg,” Jim tells me. Linc thought he could take on a shelf. The shelf won. The moment I get back onstage, it’s my turn to speak. I mumble and stumble through my part, and the speech is over. No one asks any questions and we return to our seats. Mwelp. That just happened. After the speech, people approach us, ask insightful questions, give us really amazing compliments, and we even have another inquiry about a wedding for next year. So maybe that wasn’t the train wreck I thought it was. Our anemones and sweet peas are growing and doing really well in our hoop house, so there’s a win for this week! Our daffodils are also starting to come up in the hoop house, so I’m not sure if that’s a win or a ooops. Check back in a few weeks. The holidays are quickly approaching. Do you need a thoughtful and meaningful gift? What would be better than having local, fresh flowers for 12 weeks straight? (Maybe a trip to Hawaii. Yeah, Hawaii would be better. But THIS option is a lot cheaper). 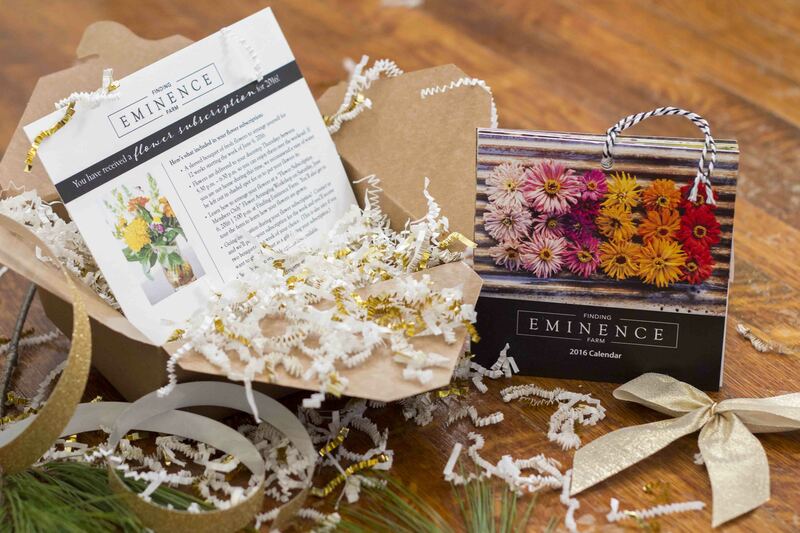 During November and December, if you purchase a flower subscription, you’ll receive a complimentary 2016 Finding Eminence calendar full of beautiful images from our farm. Contact us for more information. We also have a few dozen eggs for sale each week. They are available via farm-pick up. Contact us for eggs too.